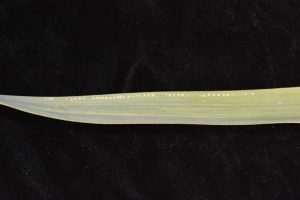 High numbers of Allium leaf miner (ALM) adults and incidence of feeding were detected in a second year, commercial planting of chives near Milford (Hunterdon Co), NJ on Wednesday of this week. Additionally, very low levels of feeding have been detected on chives near Oldwick, Hunterdon County, and Lawrenceville, Mercer County. 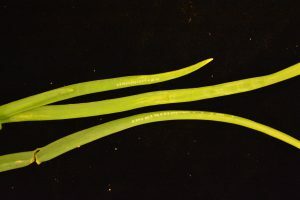 Garlic plantings in Oldwick, Milford and Hackettstown have NOT exhibited signs of feeding, nor yielded ALM adults on sticky cards. The pattern of ALM activity thus far points toward multi-year plots as being most heavily impacted in the spring. For this reason, it is advisable to separate spring and fall planted allium crops with as much distance as possible. The spring flight appears to be in full swing now. 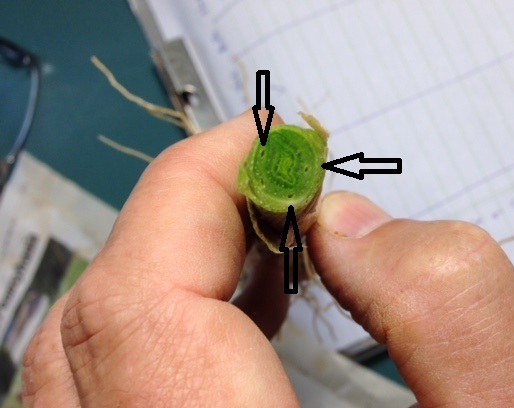 Growers should consider initiating the control method of their choice at this time. Affected crops include chives, scallions, garlic, onions and leeks. Floating row covers, kept on until the first flight ends will help minimize access to plants. Insecticide applications targeting adults may be helpful as well, although frequency of applications is uncertain. Spinosyn materials (Radiant, Entrust (OMRI approved)), pyrethroids (Mustang Maxx, Warrior), and pyrethrin materials (Pyganic (OMRI approved)), neonicotinoids (Scorpion, Venom) and the insect growth regulator Trigard are labeled for miner control. Adult activity and observations of feeding will be reported on in the IPM Update as they occur. At this time, all growers should respond to the the first adult generation. We will attempt to identify the end of the first flight so that growers know when the risk of infestation has abated. 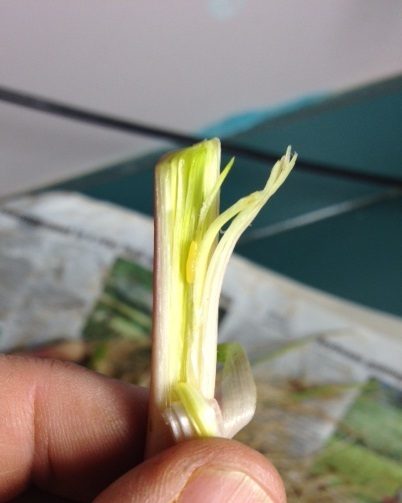 Allium leaf miner (ALM) feeding was detected in one commercial planting of chives near Lawrenceville, NJ on Tuesday of this week. Degree-day accumulations at this site were 46.5, base 50 F as of Tuesday. Sticky traps at this same site yielded no flies. Additionally, trap and inspection sites at Milford (Hunterdon Co. (garlic)), and Oldwick (Hunterdon Co. (garlic and chives)), had neither feeding signs nor flies on sticky cards. Within the week, another monitoring site near Hackettstown (Warren Co.) will be added. Reasonable spring weather that we are now experiencing is conducive to the development of the first adult generation. Growers should consider initiating the control method of their choice at this time. Affected crops include chives, scallions, garlic, onions and leeks. Adult activity and observations of feeding will be reported on in the IPM Update as they occur. At this time, all growers should respond to the onset of the first adult generation. We will attempt to identify the end of the first flight so that growers know when the risk of infestation has abated. Allium leaf miner (ALM) adults (flies) were trapped on sticky cards, and moderate levels of feeding signs were discovered late last week at sites in Lawrenceville and Pennington (Mercer County). Additionally, volunteer garlic in the Chesterfield area of Burlington County was infested. As yet, no adult activity or feeding has been found at the more northern sites in Milford, Pittstown and Asbury (Hunterdon County). Affected crops include chives, scallions, garlic and leeks. Although we are 2-3 weeks behind last spring’s development, the ALM flight now seems to be well underway in parts of the state. With warm weather forecast for the remainder of this week, growers in the northernmost counties should expect infestations to occur there as well. Allium leaf miner (ALM) adults (flies) and a very limited number of leaves with feeding signs were discovered Thursday at sites in Lawrenceville and Pennington (Mercer County). As yet, no adult activity or feeding has been found at the more northern sites in Milford, Pittstown and Asbury (Hunterdon County). Affected crops include chives, scallions, garlic and leeks. Indications are that we are 2-3 weeks behind last year’s development, but warmer weather through the coming weekend will surely result in more apparent infestations. Allium leaf miner (ALM) traps (sticky cards) were deployed on March 20, in overwintered allium crops at sites in Lawrenceville and Pennington (Mercer County), and Milford, Pittstown and Asbury (Hunterdon County). These traps have been checked weekly since that time and have returned no positive ALM catches. Host crops at these sites (chive, scallion and garlic) were free of injury as of April 5. In 2017, traps placed at these locations were already catching ALM adults by the end of March, and feeding injury was easily discovered on chives. Indications are that we are 2-3 weeks behind last year’s development. 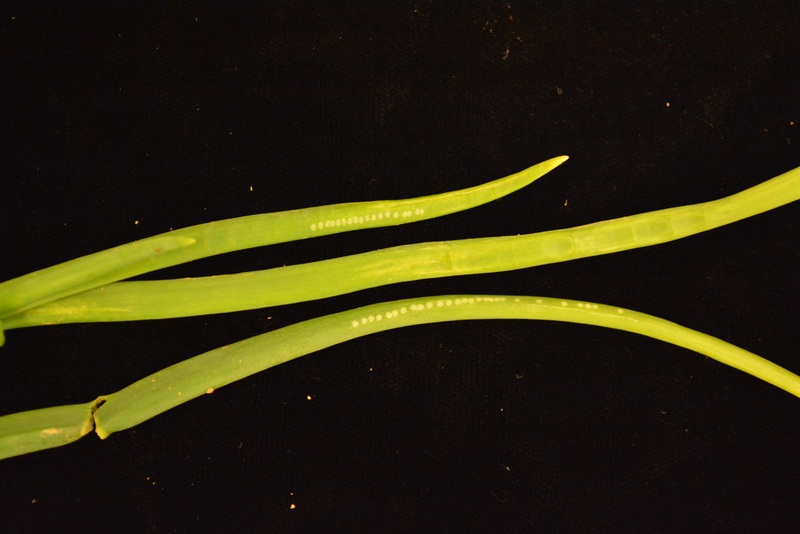 We do have confirmed injury and sighting of adult ALM on scallions in high tunnel production in the Pennington area, but insect development in this warmer protected environment is not indicative of what is occurring outdoors. As weather warms, expect adults to emerge and become active. They will feed on available allium crops, which will include overwintered chives and garlic as well as newly transplanted onions and scallions and leeks. Look for characteristic dots (see photo at center) on the upper portion of upright leaves. Expect that any plant with these feeding/egg laying scars is infested. Larvae will tunnel downward (see photo at right); ultimately pupating in the neck of the plant (see late instar larva at left). Adult activity and observations of feeding will be reported on in the IPM Update as they occur. We will attempt to identify the beginning and end of the first flight so that growers know when they should initiate control tactics and when the risk of infestation has abated. A sample of unsprayed/unprotected volunteer garlic near Asbury on the Hunterdon/Warren County border today showed 68% of plants infested with allium leaf miner (ALM). These maggots were all later stage, and found in the necks, about 1″ above the bulb (see photo at upper left). We should expect that all untreated/unprotected allium crops are similarly affected at this time. Interestingly, 100% of infested plants had visible feeding/egg laying scars (see photo at center above), while 100% of uninfested plants showed no visible signs. None of the plants had mines visible on the surface, but cross sections of the neck revealed clean tunnels the maggots had created on their way down (see photo at right, above). Our colleagues at Cornell, operating in the Hudson Valley had notified us that they had had no success catching ALM adults on sticky cards, and we have had the same difficulty in NJ this Fall. This is unlike our experience in the Spring, when we were able to catch numerous individuals at nearly every trap site. Additionally, the generation of adults emerging in the Spring here in NJ heavily infested chives; the earliest possible host. This Fall, chives appear to be largely uninfested, while onions, scallions, and leeks are showing the most feeding/egg laying scars. Be aware that if no program of protection was enacted roughly 3 weeks ago, Fall allium crops may be heavily infested at this time.